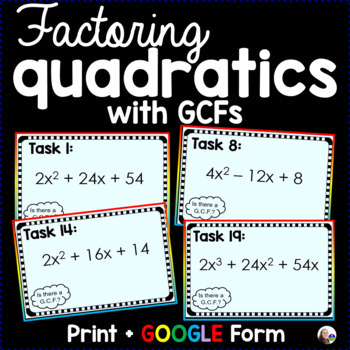 Students factor 20 trinomials with GCFs in this activity. On every card, once the GCF is factored out, A=1. 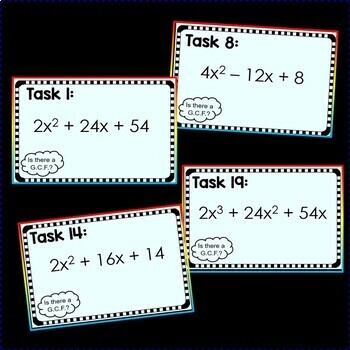 Depending on the level of scaffolding your students need, this activity can be used as either a matching activity or task cards. 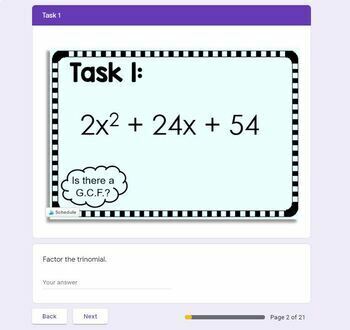 You may choose to have students factor the trinomials on each of the 20 task cards and record their answers on the included answer sheet. Or, if your students need a little more support, you may choose to use the included factored cutouts with the cards in a matching activity. Two versions of a student recording sheet are included: 1 for task cards where answers are open-ended and 1 for recording match letters. Also included are 2 versions of an answer key. **The preview file is the entire activity. If you cannot see any pages, you may download it first before viewing.